* Every tool you need to build a coil. * Sturdy carry case with smooth zipper. * Includes 24g Kanthal and organic cotton. 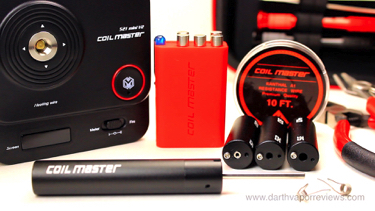 The Coil Master DIY Kit V3.0 is the latest version of the popular coil building kit. The kit comes in a cardboard box. Inside the box, the case is enclosed in a protective bag. Open the bag to reveal the case. 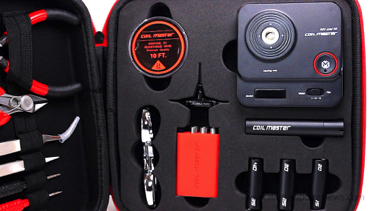 The Coil Master case is made of high quality materials with a smooth zipper. Inside the case are tools on both sides fitted in place by sturdy foam. 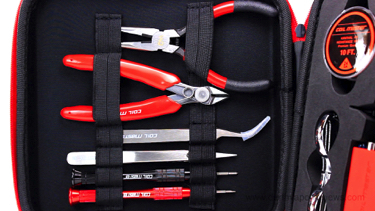 On the left side, the tools include: Needle Nose Pliers, Diagonal Cutting Pliers, Elbow T3 Tweezers, T1 Ceramic Tweezers and Pen style Phillips and Flathead screwdrivers. On the right side, the tools include: a 10ft spool of Coil Master 24g Kanthal A1 wire, Stainless Steel Folding Scissors, a silicine rubber case for Jigs, a T-style HEX Screwdriver in sizes 1.25, 1.5 and 2.0 millimeter. Three Top covers, One Base, a bag of Japanese organic cotton and the 521 Mini V2 Tab. Add the Coiling Pole and re-attach the Top Cap back on to the Base. The matching number Top Cover will be the only one that will fit on the Coiling Pole. 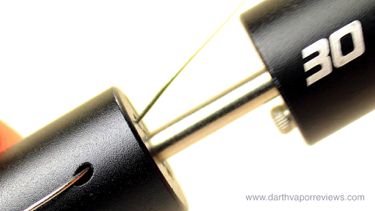 Unroll 8-10 inches of Kanthal wire and cut it with the Cutting Pliers. Insert an end of wire into one of the holes in the Base and slide the Top Cover on. Now, you can test the coil on the Tab. The 521 Mini V2 Tab is an Ohm Meter, Voltage Drop Checker, Rebuilding Station and a Firing Station. 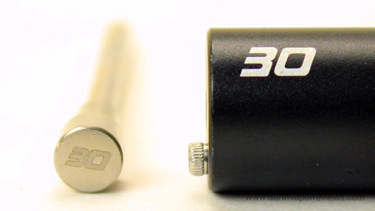 It has a spring-loaded 510 connection and is able to measure resistance down to 0.05 ohm and dry fire coils down to 0.01 ohms. It features reverse battery and short circuit protection. Press the Top Cover firmly against the Base for the first wrap to hook the wire. 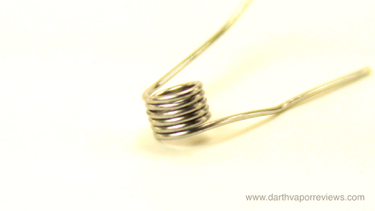 Start twisting with less pressure so as not to overlap the coil on to itself. 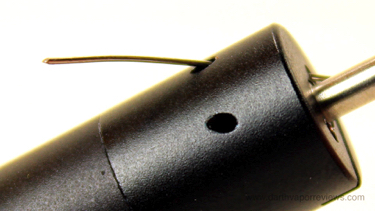 Once you have your coil made, slide it off the Coiling Post, flip it around and slide it back down. Add the Top Cover and give the coil a firm press to tighten the wraps. That's it. You've made a coil! 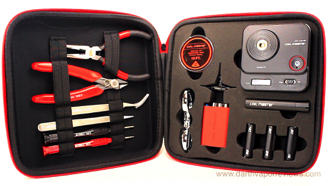 The kit currently runs in the $40 - $50 range which is a great deal as the Tab ohm reader alone costs $20. 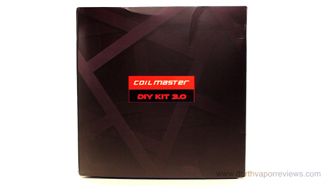 If you would like to pick up the Coil Master DIY Kit V3 for yourself, just click on the links or the logo below. Have an excellent day and may the Vape be with you. To make a coil, choose your size. 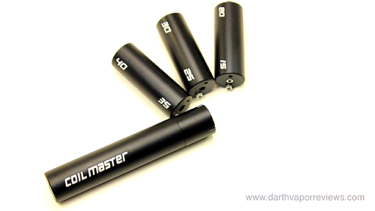 The kit comes with six different Coiling Pole sizes as well as a Blue screwdriver. The sizes range from 1.5 to 4.0 millimeters. The numbers on the Coiling Poles match the Top Covers. Once you have picked a pair, unscrew the Top Cap from the Base. 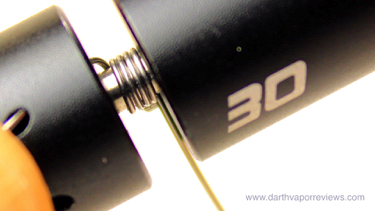 The two holes in the Top Cap can accommodate two-way directional wrapping as well as a wide slot for larger wire. You want the coil to heat from the inside out. 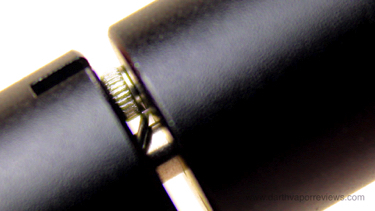 Squeeze the coil with the Ceramic Tweezers and lightly scrape the top to work out the kinks. 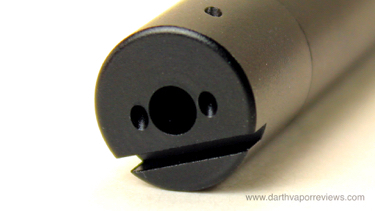 With Ceramic, not Metal, you can squeeze the coil while firing it. 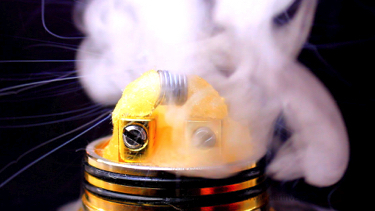 When the coil fires more evenly, let it cool down while you prepare the wick. Open the bag of included Coil Master organic Japanese cotton. The bag with this kit came with three pads. 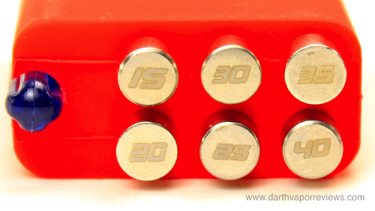 To use the Tab, install a fresh 18650 battery in the back compartment. Screw an atomizer base to the Tab Deck. 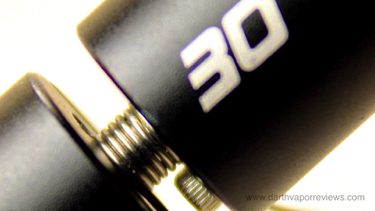 Add your coil and tighten with the Screwdrivers. Snip the excess leads with the Diagonal Wire Cutters. Switch the Tab setting to Meter to test the coil. Now test fire. Don't hold, but instead short press the Fire Button so as to not burn the coil. The first fire shows the coil heating from the outside in. It probably would have been a little easier if the kit I received had included an instruction manual, but I figured it out. It's pretty straight forward, just a little tricky when you're used to handwrapping. With a little practice, I think I'll make better coils with the Coil Master Jig. Cut a strip of cotton and feed it through the coil. Using the Elbow Tweezers, fluff the cotton wick and tuck it down into the base. Add e-liquid to the wick and test fire the coil. You'll know the coil was a success when you're splattered with a million drops of e-liquid. I really enjoyed using this kit. It was a little tricky at first and I made a few bad coils before getting the hang of it. A valuable kit for vapers. 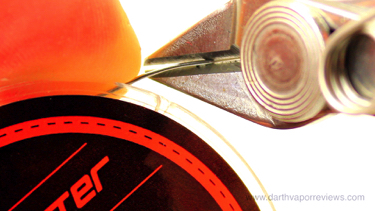 I have tried using the Coil Master 5-in-1 a few years ago. 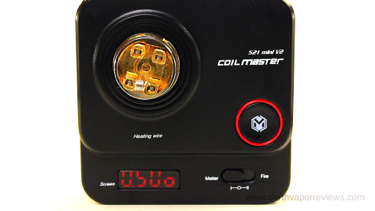 The new version is called the Coil Master V2. 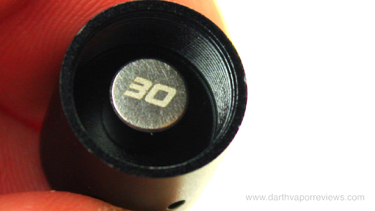 It's a smaller kit that comes with a few of the same tools as the Version 3. The 4 sizes of the V2 are 2.0 to 3.5. I wasn't as impressed with the kit back then as I am now. Probably because all of the tools in the V3 kit are a huge motivation to get creative making coils. The kit has everything I needed and didn't have. the quality of the tools seems to be pretty good as well. The 521 Mini V2 Tab was the icing on the cake because I didn't have an Ohm Reader except for various box mods. The case is very nice and feels very sturdy. The tools though are a little tricky to get back into the spandex-like straps. Overall, a great kit with everything you need to make a coil and wick it.